I have a div which contains a some slides and menu. Below is my css for div. Can anyone explain me what does the transition property do here?. I am not able to understand the effect its going to produce on div. that property is for the animation of <div id="wrap"></div>. It means it will animate using top property! So there are 4 points, but the function only mentions P1, and P2 with their corresponding X and Y values? 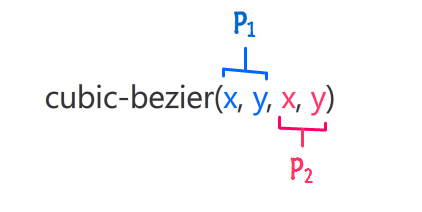 For CSS Bézier Curves, P0 and P3 are always in the same spot. P0 is at (0,0) and P3 is at (1,1). An important thing to note is that the points that get passed in the cubic-bezier function can only be between 0 and 1. So if you decide to try something like cubic-bezier(2,3,5,2), you’ll be banished to linear easing, the worst of all easing functions. That’s like a font-family falling back to Comic Sans. Also notice that the x-axis is the time the animation takes, and the y-axis is the property being changed. Based on the graph above you can visualize it easing quickly in the beginning, slowing down in the middle, and picking up speed at the end. 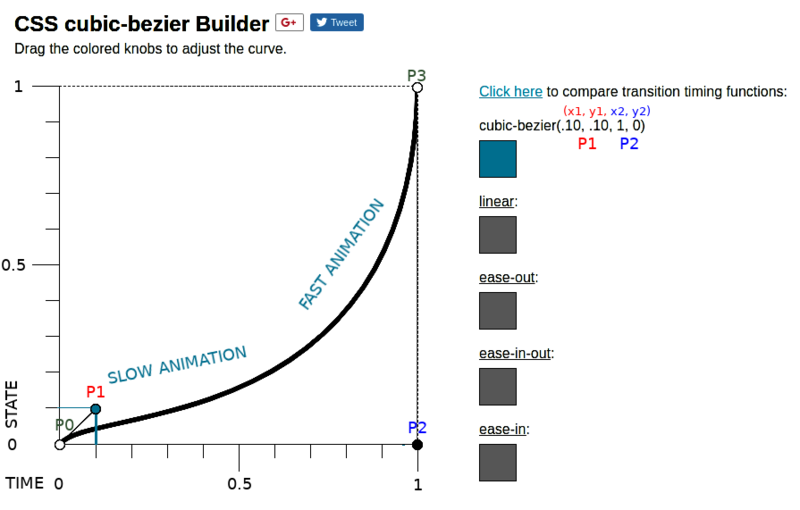 I would like to provide another explanation of cubic-bezier function by someone who just understood how it works. I had some trouble with it while going through the tutorials on https://freecodecamp.org. I grasped it after reading the previous answer by eirenaios and using the cubic-bezier builder. Bezier curve is based on four points: P0, P1, P2, and P3. P0 is set by default to (0, 0) and P3 is set by default to (1, 1). 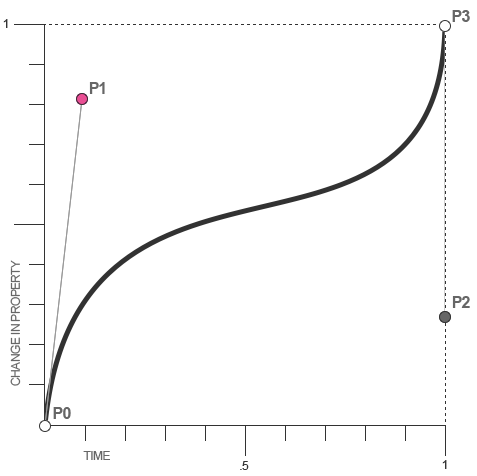 P0 and P3 are the beginning and the ending of the curve and you can't change them. The curve will stretch differently depending on what coordinates you give for points P1 and P2. Not the answer you're looking for? Browse other questions tagged css css3 css-transitions bezier cubic-bezier or ask your own question.